Data volumes in the digital world are growing exponentially and to remain competitive and relevant, enterprises today need to harness this big data to gain meaningful business insights.This trend is not just limited to non-traditional data, but also traditional data sources (CRM, ERP, Transactional systems) that are generating far too much data today, than they were a few years ago. Big data migration typically involves multiple source systems and large volumes of data. However, most organizations lack the opensource tools to handle this important task.The right tool should be set up quickly and offer multiple customization options. Migration generally happens in entity batches. A set of entities is selected, migrated and tested. This cycle goes on until all application data is migrated. users across the multitude of products they offer. • Huge volumes of data that exist in traditional warehouses need to be migrated. 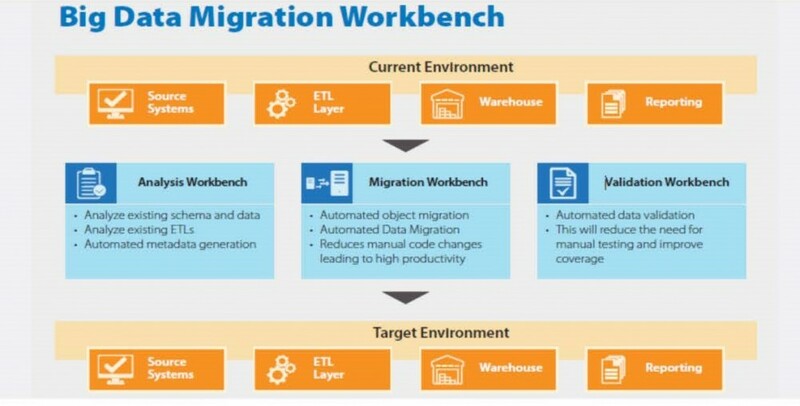 lnfonex Big Data Migration Framework can accelerate your data migration from a traditional warehouse to a big data warehouse by automating manual tasks. Unlock the power of data science to create reports using tools of their choice. Automate data testing and data validation for the migrated data. Accelerate your data migration using Infonex Big Data Migration Framework.